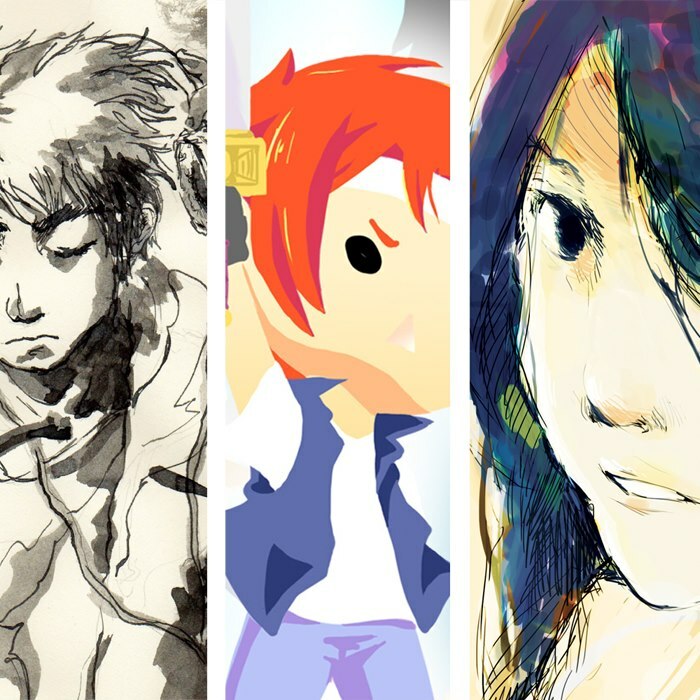 The Cel Shaded Report, 5/2: Comics comics comics COMICS! Iron Man 3 opens on Friday. Star Wars Day — “May the Fourth be with you,” get it? — is on Saturday. And comic book geekery, let’s face it, can just be downright fun. So it is that we’ve come to the annual celebration of comics, downright fun and WOO HOO FREE STUFF known as Free Comic Book Day, happening on Saturday. It’s one of those days when even comic creators can be fans. Why, here’s team nemu*nemu, Audra Furuichi and Scott Yoshinaga, with McCully-Moiliili librarian Linnel Yamashita from FCBD 2012. Of course there will be regular comics — you can scan the full list of possible giveaways (keeping in mind that not everywhere will have the full range of comics) here. 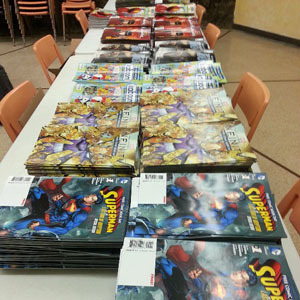 Here’s a picture that Aiea Library young adult librarian Diane Masaki sent along of some of the comics that she received to distribute to the various libraries (more on that in a bit). 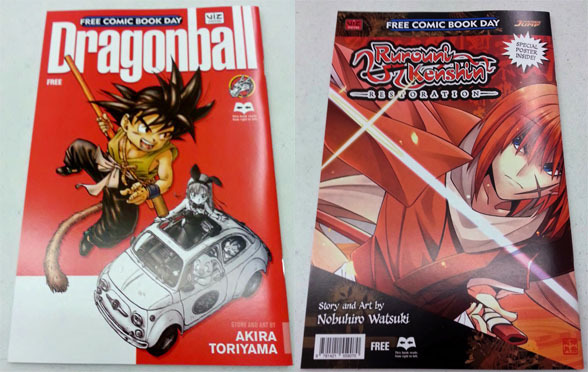 But as the anime/manga blog of record in the Star-Advertiser blogosphere, I’d be remiss if I didn’t show you Viz’s manga contribution to the comic party: samplers from Dragon Ball (that’s the original series, showing Goku as a young boy) and Rurouni Kenshin: Restoration (Nobuhiro Watsuki’s remixed take on his samurai series, currently being serialized in Weekly Shonen Jump USA). If you visit any of these stores, don’t forget to throw some money at them and buy something in appreciation, too — supporting local small businesses is always a good thing. And then there’s McCully-Moiliili, where there’s a series of three asterisks instead of a regular dash in its row because branch manager Hillary Chang has a whole program planned to go along with the free swagfest. At 10:30 a.m., cartoonist Ray Friesen will talk about Pirate Penguin vs. Ninja Chicken, an all-ages graphic novel series that’s actually one of the series featured in Top Shelf Comix’s Top Shelf Kids Club anthology being given out during FCBD 2013. Between 11 a.m. and 1 p.m., local anime/manga-inspired art group Pen & Ink Works will be hosting a sketch meet, demonstrations and games. Drawing supplies will be provided; just bring enthusiasm and a creative spirit. And since members Brady Evans, Tara Tamayori and Rose Dela Cruz also happen to be three-quarters of the creative team behind local manga anthology Hachi Maru Hachi, they’ll be joining writer Jordan Takemoto and talking about the process of putting the latest issue together. Show them a manga page you’ve drawn — whether at the sketch meet or elsewhere — and you can get a postcard with some official Hachi Maru Hachi art, too. Here’s an idea of what they look like. I’ll update this post if there’s any more news of FCBD events or online giveaways, but for more on the day itself, visit www.freecomicbookday.com. And don’t forget: Be polite and stay within whatever limits each venue sets for the number of comics you can snag for free. No one likes a greedy person getting in the way. 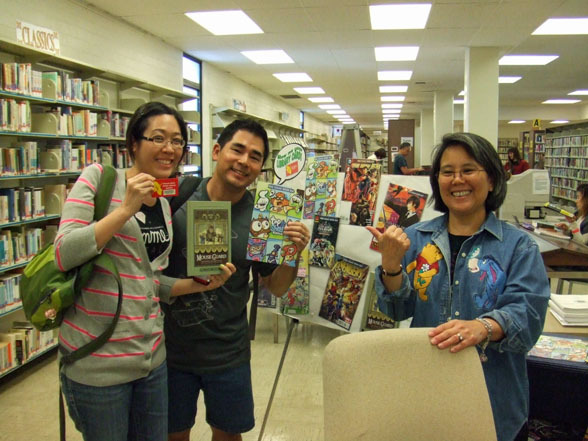 Update 5/3, 2:40 p.m.: Freebie added to the Aiea Library festivities: Trading card packs, featuring art by some of the Comic Jam Hawaii artists. Update 5/3, 6:30 p.m.: Lime Media Hawaii is offering free digital copies of Hawaii Star Manga Project issue #5. Visit www.limemediahawaii.com. Also, don’t forget to bring your library card if you’re visiting the libraries for your free comics. Update 5/4, 7:15 a.m.: Over at The Beat, Heidi MacDonald has previews and recommendations for every single FCBD book available today. It’s a great guide to take on the go if you have the technological means to do so! Part 1 covers Gold sponsor books, while part 2 and part 3 cover Silver sponsors. Also through May 5, Nao Yazawa — the manga artist whose series include Wedding Peach and Moon & Blood — is offering her 77-page autobiographical manga, Go Go Nao-P!, for free on Kindle devices. (After that, it’ll cost $2.99.) According to Anime News Network, Yazawa has said the English version seems to be working only on Fire and Paperwhite models at the moment; I’ve tested it through the Kindle app on my iPad, and it works fine. It’s a collection of 4-koma manga that she first published on her blog starting in 2010. She even translated it to English herself, so while the sentences are a bit stilted, it’s still an impressive feat. I’d have to imagine that with the English dubbed version of Studio Ghibli’s From Up on Poppy Hill entering its fifth week at the Kahala 8 theaters, these are the final days for this film’s run in Hawaii. Then again, I said that in last week’s Cel Shaded Report, and we all know how that prediction fared. It’s a bit more cut-and-dry for the Japanese audio/English subtitled version that quietly landed at the Pearlridge West 16 theaters, though. You have six more chances to see it — three today, three more over the weekend — because that version is being nudged out after Sunday. (Looking at the schedule, I think it’s to free up an auditorium for another set of Iron Man 3 screenings on weekdays.) (Update 5/3, 2:40 p.m.: It’s already gone in favor of more Iron Man 3 screenings. Sadness.) Such is life, though, and I certainly applaud Consolidated for bringing in the subbed reel in the first place. Here are your showtimes, via Fandango. Tickets can be purchased in advance here. Friday and Saturday: Noon and 2:10 p.m.
Monday through Thursday: Noon and 2:10 p.m.
Friday through Sunday: 10:30 a.m.
MangaBento: This group of anime- and manga-inspired artists usually meets every second and fourth Sunday of the month at the Honolulu Museum of Art School (1111 Victoria St., room 200). Visit www.manga-bento.com. Next meeting: 1 to 4 p.m. May 12. Next Next post: The Cel Shaded Report, 5/10: ‘Poppy Hill.’ Again. Yup.